We are lucky to have helms designed by some of the most famous artistic armorers of our age. We have searched the known world to bring you these helms by the best craftsmen in our trade. Our famous line of lifetime guarantee helms will protect you in style. Designs range from Ancient to late medieval helms. All of our helms are at least 14 gauge or better. Low profile. Great protection for ACL/ IMCF combat. Amazing Gold color powdercoat!! Powdercoat is available in many colors. Let us know your choice. This service averages about $150, depending on options. 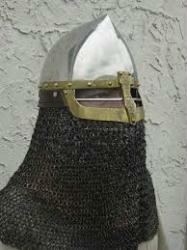 Block visor Bascinet . Tough as Bobby D's head. Perfect close cell foam for comfort and protection. 2 pieces will do most helms. Engineered along the same lines as professional football helm padding. Great protection for ACL/ IMCF!!! State head size. Small medium or large. Hand made of all natural materials. 3/4 thick quilting. Just add a nut to the bottom of these and you have a very easy installation. Solid Brass Construction. Just add a nut to the bottom of these and you have a very easy installation. Solid Steel Construction.